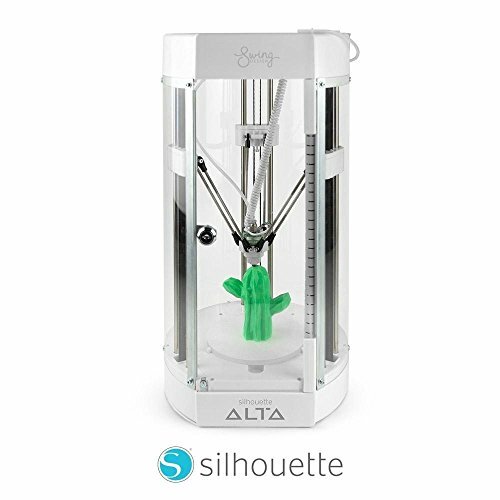 The Alta allows you to adjust your print settings depending on the project. Prints at fast and slow speeds, prints at low and high temperatures and can print up to 120 mm tall and 116 mm wide. The Silhouette CAMEO Starter Bundle includes an extra mat (2 total), cutting blade (2 total), metallic pen set and pick-me-up tool. The Silhouette CAMEO is an electronic cutting tool for personal use. Like a home printer, it plugs into your PC or Mac with a simple USB cable. However, instead of printing it uses a small blade to cut paper, cardstock, vinyl, fabric and more up to 12-Inch wide and 10-Feet long. The machine also boasts a quiet motor and the ability to register and cut printed materials. The Silhouette CAMEO is amazingly versatile. It can create intricate projects of all sizes from small (1/4″ wide) to large (12″ wide) and has an unlimited cutting length. It can cut paper, cardstock, vinyl, fabric, and other materials. It operates with or without a cutting mat. When the blade is replaced by a pen, the CAMEO will sketch instead of cut. It can be controlled from a computer or an SD card. With the print and cut feature, the CAMEO also has the ability to cut out designs that have been printed on your home printer. Easy To Use and Fully Featured: The CAMEO cuts designs created in the Silhouette Studio software. This software is free and offers a wide variety of tools and functions to help create custom projects quickly and easily. The Silhouette Studio software can also manipulate and cut fonts you already have – if a font is installed on your computer, you can use it with the CAMEO. Scrapbook Pages: Scrapbooking has never been easier than it is with the Silhouette. When it comes to shapes, titles and paper embellishments, the Silhouette can do it all. You’ll have access to nearly all of the fonts on your computer and, with the included software, you’ll be able to cut your designs in any size to get the perfect fit for every layout. Custom Apparel: With the Silhouette’s intricate cutting ability and freedom to choose and customize designs and text, creating custom shirts, jeans, shoes, and more is easy enough for anyone to do. Cut and iron on simple phrases or intricate layered designs in heat transfer material or add some bling to your wardrobe by cutting rhinestone templates with a Silhouette rhinestone starter kit. Vinyl Décor: Vinyl décor is quickly becoming one of the most popular ways to decorate homes. Easy to cut, self-adhesive, and removable, vinyl is the perfect way to add your favorite quotes and designs directly to the walls of your home, car windows, and projects. Best of all, Silhouette vinyl is priced just right so you can just peel off your designs when you’re ready for something new. Paper Crafting: Intricate cuts, precision duplication, and smooth edges make the Silhouette the perfect tool for paper crafting projects. Whether you’re a novice creating a simple gift box, or a pro creating paper castles and models, the Silhouette can make your crafting quicker and easier. Silhouette also offers several tools to help you work with paper products including the pick-me-up tool used for poking out intricate cuts and placing tiny paper pieces onto finished surfaces.